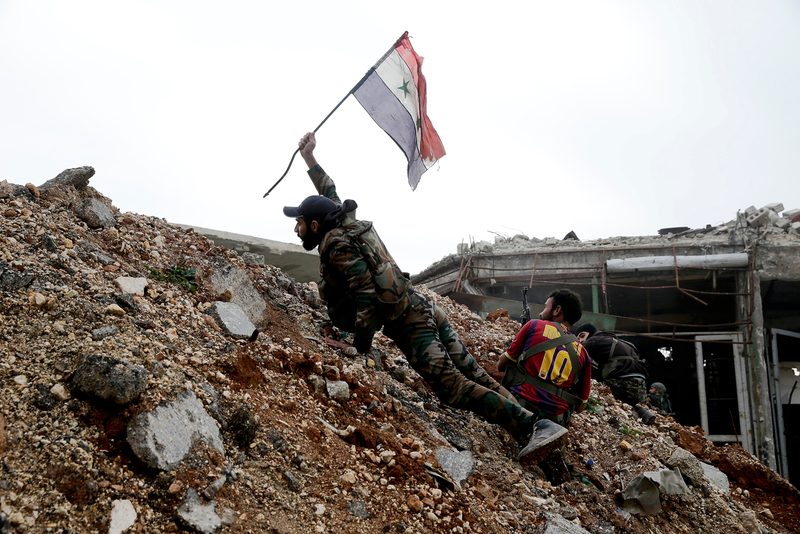 A Syrian army soldier places a Syrian national flag during a battle with rebel fighters at the Ramouseh front line, east of Aleppo, Syria. With the Syrian Army, with Russian Air Force support, retaking new districts in Aleppo, Moscow's actions received international support from an unexpected quarter. Beijing backed Moscow by joining Russia in blocking a UN Security Council Resolution seeking to push for a ceasefire in Aleppo. The vote on a UN Security Council Resolution in New York on December 5 is the sixth since the beginning of the Syrian War in which Russia exercised its veto power to block opponents' initiatives. This time, however, the vote is being seen as a watershed in the diplomatic battles around Syria. Unlike the earlier vote on Syria in October, this time there was a double veto. China joined Russia this time to vote against the proposed resolution, which sought to stop operations by Syrian government troops in Aleppo for a week. Beijing's position discouraged the other permanent Security Council members - the US, the UK and France – from pressing the issue. Liu Jieyi, China's Permanent Representative to the U.N, explained Beijing's reasons, saying the proposed resolution splits the world powers and does not promote diplomatic regulation. The Security Council's role, he said, is to "preserve unity around the Syrian issue, speak with one voice and work together." The acquisition of a new ally on Syria in the Security Council is not Moscow's only diplomatic success. Besides Venezuela, which voted against the resolution, and Angola, which abstained, Egypt - one of the author's of the resolution - expressed a particular position. Commenting on the double veto, the Egyptian Foreign Ministry not only did not criticize Russia and China, but even offered a veiled rebuke to their opponents. The ministry statement expresses regret that, "several member states insisted on proposing the resolution for a vote in the form that was not approved by all countries." Vitaly Churkin, Russia’s Permanent Representative to the UN, confirmed that the draft resolution had only been distributed barely hours before the vote. Cairo's special position confirmed the fact that Egypt has distanced itself from the West and the Persian Gulf monarchies on the Syrian issue over the past few months. Those countries are still demanding a regime change in Damascus, while Cairo’s stance brings it closer to Russia and Iran. The gradually shifting positions among world and regional players can be explained by the situation in Aleppo. The operation to take back Syria’s second largest city is coming to an end. The defence, which opposition units have put up for four years, is being destroyed by the united forces of the Syrian Army, the Hezbollah from Lebanon and Shiite militia units from Iran, Iraq and Afghanistan. Since the offensive in eastern Aleppo began on November 15, opposition troops have lost around 70 percent of the territory they controlled in that area. News arrived on December 6 of government forces taking another five districts in eastern Aleppo, including al-Shaar - the most populated district and a key zone for the offensive. According to Arabic mass media, the commanders of several opposition units are trying to establish contact with representatives of the Syrian command to discuss the possibility of evacuating the militants and their families from Aleppo. This was how the sieges of many cities controlled by enemies of the government ended in the past (Hama, Homs, as well as settlements in the peripheries of Damascus). "It would have been illogical to stop the assault on Aleppo"
"The fact that Russia blocked the draft UN Security Council resolution in the form it was is completely natural," explained Vladimir Sotnikov, director of the Russia-East-West Centre for Strategic Studies. "Stopping the assault on Aleppo now, when government forces are just one step away from victory, would have been absolutely illogical. In those seven days of ceasefire that the UN Security Council was proposing, the opposition forces would have strengthened their positions and regrouped. As a result, the assault would have been prolonged, causing more bloodshed." "Now is not the time to weaken the invasion. If the Aleppo problem can be solved in the coming weeks, it will make future negotiations on the political regulation of Syria significantly easier," Sotnikov is convinced. The expanding circle of countries that do not want future diplomatic confrontation with Russia will be another argument for Moscow to bargain with on Syria, when the new US administration assumes functioning from January 20.